A high quality folding-arm quadcopter frame that offers great looks and performance at a price that can't be beat! Built from light weight yet rigid glass fiber and aluminum, it offers a great combination of weight savings and strength. This quad features folding arms which make it easy to transport and store. The arms are also two different colors for orientation, gold and black, so it's easy to keep your quad flying in the right direction. The glass fiber universal motor mounts will accommodate a wide range of motors and double as a vented ESC mount providing excellent cooling. All necessary hardware is included, just add your own electronics. May i have a quotation of all the required accesoriess that match with the glass fiber frame that can make it fly. Hi, thanks for the question, I've replied via email. Selecting the correct frame & configuration: The frame forms the core of all multi rotors. It’s the structure that holds all the components together so it should be rigid, and be able to minimise the vibrations coming from the motors. An array of materials are used to make them, including composites such as carbon fiber; metals most commonly aluminum; plastics for instance polyamide nylon; and even woods for example plywood. All have benefits and disadvantages but the decision usually comes down to factors including weight, strength, rigidity, dampening ability and of course cost. Carbon fiber is often preferable as it's extremely light, rigid and inherently shock absorbing, however it’s expensive. Plywood on the other hand is inexpensive, good at dampening vibrations, relatively light and easy to work with and cheap to repair. It's therefore a good option for beginners or those self building their own frames. There are also a whole host of multi-rotor types and by ‘types’ I mean frame configurations, which is essentially dictated by the number of motors and their position relative to one another. For example the terms tricopter, quadcopter, hexacopter and octocopter are frequently used to refer to 3, 4, 6 and 8 rotor UAVs, respectively. On the other hand, regular and coaxial setups refers to the location of the motors mountings where the latter refers to a stacked, one up one down setup; coaxial setups have become known as Y or X configurations. 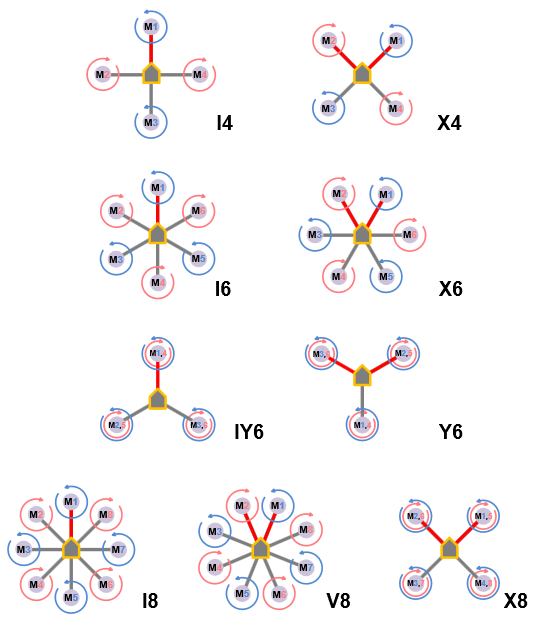 Take a look at this image to visualize the most common multirotor configurations. Some individuals have even created X12 and X16 configurations, but these are not supported as standard by all flight computers. The choice of frame will effect many aspects of the multi rotor, including efficiency, lifting power, flight times, stability, and redundancy in the event of an engine failure, therefore there are numerous reasons for choosing each of the specific setups. Generally speaking the largest payload that you intend to carry should principally guide your choice. Example payloads range from nothing / lightweight cheap cameras, up to heavy £20k+ broadcast quality equipment. Heavier payloads require more lift which means more motors or larger props or a combination of both, usually this equates to a larger airframe (a hexacopter or an octocopter). In addition to the weight factor there is always a payload safety consideration. This relates to a term call multi rotor redundancy; the dependency a craft has on all motors functioning correctly to maintain flight or land safety. Quadcopters (X4 & I4) have no ability to recover or land with an engine failure. With one engine missing, hexacopters (X6 & Y6) can survive with limited or zero yaw control (the aircraft will spin to compensate for the one missing motor), dependent on flight controller. Finally, octocopters (X8, I8, & V8) can all fly perfectly well with one engine lost. You may well not even notice it until you have landed. It is often argued that coaxial configurations have better redundancy, as they are intrinsically better able to maintain thrust symmetry. Flight characteristics are another factor to consider. Smaller frames are typically more agile; a quadcopter can be extremely acrobatic. On the other hand large octocopters provide a very stable platform; they are usually heavier so sit better in windy conditions. This leads onto application. Drones are used for an array of different things and certain frame types are more suitable than others. For example, coaxial frames are often better than traditional configurations for aerial photography due to having fewer booms to get the in shot. Practically should also be considered. Octocopters aren't small some exceeding 1.3m in diameter. Therefore if transport will be an issue, a coaxial multi rotor, or foldable frame may be more appropriate. Finally and inevitably there is the question of cost. Price rapidly increases from a quadcopter to an octocopter, as you suddenly need more of everything (motors, ESCs, wiring, etc). Remember that it is generally a waste to lift a small compact with a multicopter designed for a Red Epic, so there is no benefit of going for a large heavy lift aircraft, if it will never be needed. You will get more value, and efficiency by getting a well matched frame for your payload.